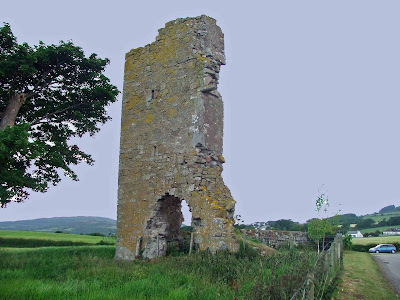 This fragmentary scrap of a tower can be found about 6 miles to the East of Kirkcudbright, on the A711. The remains can be seen from the main road, but are easily accessible about a quarter of a mile down a minor road. As can be seen from the photos, all that remains is a single corner of a four or five storey tower, with two tiny slit windows, and what could be the destroyed arch of a door. The rest of the tower is gone, demolished and or quarried away over the years. The tower is certainly in a perilous state, and doesn't appear to have had any consolidation work done on it. 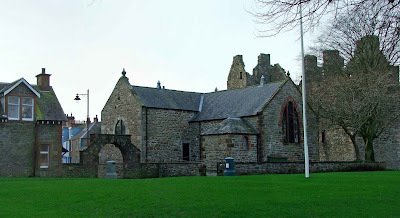 It's thought that it was built sometime during the 16th century, and is said to have belonged to the Scottish Regent, James Douglas, 4th Earl of Morton. James Douglas was one of four regents who oversaw Scotland during the early years of James VI's rule. He was famous for introducing the Maiden to Scotland...a Scottish version of the Guillotine. Ironically, he was executed using the maiden in 1581. The remains of this sorry tower can be seen freely at the road side. 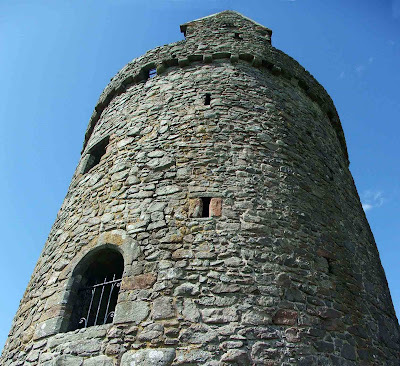 The beautiful and well preserved tower can be found just off the A711 about seven miles East of Kirkcudbright, and about a mile and a half South of the small village of Palnackie. The tower sits on a gentle slope that leads to Orchardton burn which runs a hundred yards or so away. The tower is unique Round tower (in Scotland). The almost perfect condition of this tower also makes it something special. Not only are the outer walls intact, all the windows and their surrounds are present, the interior staircase leading to all floors is intact and usable, and there is a small portion of the wall walk at the very top that can be accessed. The only items missing are the timber floors and the roof. There are even the remains of storage and external buildings, including a vaulted storage cellar. 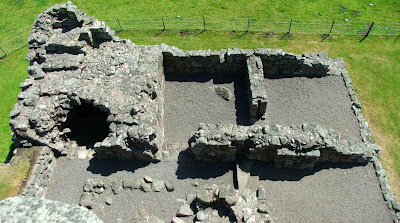 Originally the tower would have had a curtain wall surrounding the small courtyard area, but this has been reduced to ground level in most areas....although there are a few parts that are above ground but turf covered. 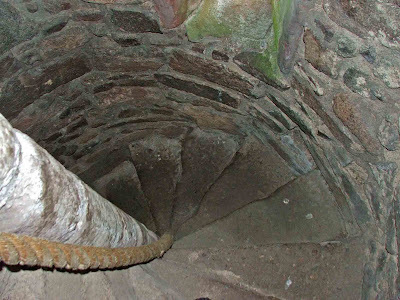 Climbing the narrow spiral stair case, brings you right to the top of the tower. 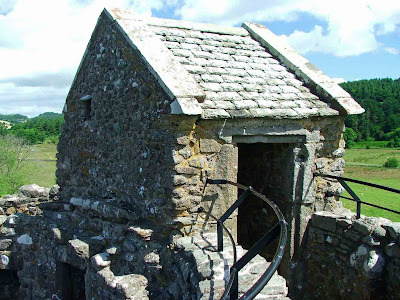 Here there is a tiny gabled cap-house, which brings you out onto the wall walk. This would originally have given you access to the whole circumference of the tower....however only a small portion is now walkable. The views from the top are stunning. The walls are around 9 feet thick, especially at the base, although they look a little narrower the higher you go! The entrance is via a stone staircase, although it's unlikely that this is original. Entry, when the tower was being used, may have been up a set of wooden steps that would most likely have been collapsible. 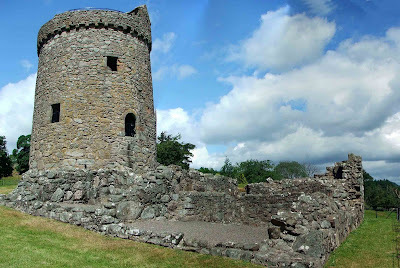 The tower was probably built sometime after 1546, when John Cairns retired to the area. 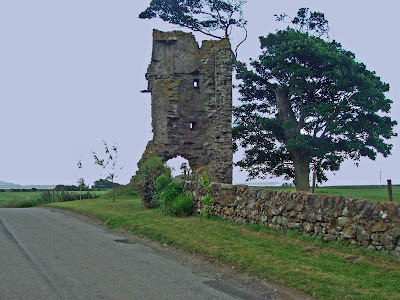 In 1555, as the result of the end of the Cairns family line, the tower and the lands were transferred to the Crown, until it could be agreed who should inherit the estate. It wasn't until 1615 that the estates were finally released from Crown care, and into the hands of Sir Robert Maxwell, the 1st Baronet of Orchardton. The Maxwell association with the tower continued for 150 years, until the 7th Baronet of Orchardton moved to a newly built mansion nearby. The building of the new mansion unfortunately bankrupted the Baronet, and he sold the estates, including the tower to James Douglas from Liverpool in 1785. 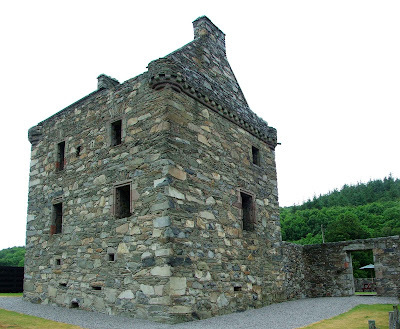 Now in the care of Historic Scotland, the tower and it's buildings are freely accessible. 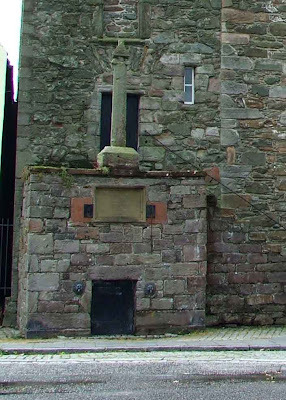 The tiny church of Greyfriars sits almost in the centre of Kirkcudbright, and only a few yards away from MacLellan's castle. The church and its graveyard sit on top of a motte that on the East side still stands to around 15 feet in height. The West side is now at street level. It is believed that the Lords Galloway had one of their first castles here, a small motte and bailey fortification....sometime in the 12th century. 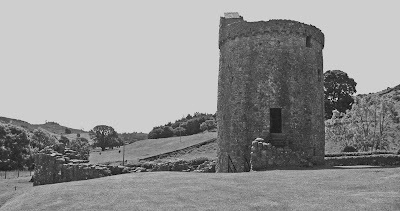 Historical documents indicate that the original motte and perhaps its attendant bailey, would have extended North, underneath MacLellan's castle. 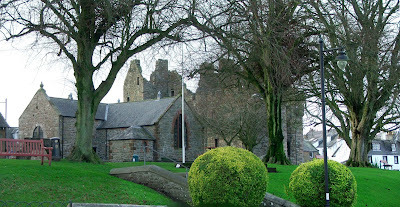 The town defences in Kirkcudbright (castles aside) consisted of walls, ditches and earth ramparts. These basic structures were built prior to the 1540's as defences against attacks by the English. The defences utilised natural marshes on the South West, South and East of the town.....areas now occupied by St Mary's street and St Cuthbert's street, and were re-inforced by a wall that ran to the East of the church, roughly following High Street to the site of the Meickle Yett. 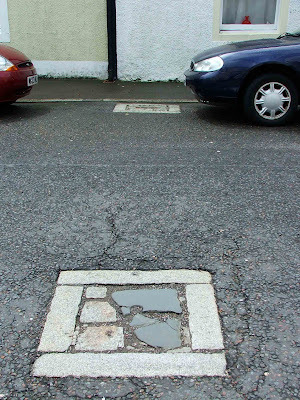 The Yett was the main entrance into the town, and its original position can be traced today by the survival of two marks in the road, half way up High Street. The yett was rebuilt in 1590...possibly as a more heavily defensible structure. The yett was removed from this spot around 1780, and rebuilt in the church yard. Up until the 1850's, parts of the defensive ditches were still visible, but these seem to have long since been removed or have simply eroded over time. 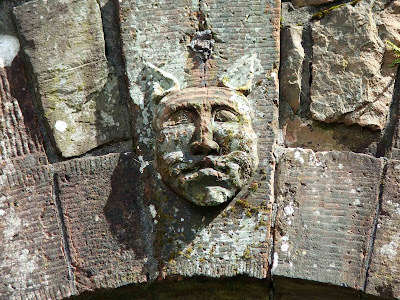 The decorative face carved into the key-stone of the arch is visible from the street. I'm not sure if this is of the same age as the yett though. 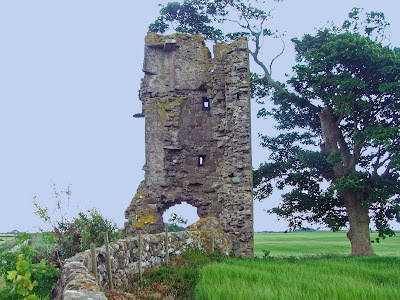 This Scottish tower house can be found on the A75 about 2 miles South of Creetown, and about 3 miles West of Gatehouse of Fleet. The remains are simply stunning, well preserved, and although on private property, are accessible to the public, sitting as they do in the grounds of a small tea room. Initially, as you’re speeding past the castle it look complete and possibly inhabited. However, on closer inspection, this initial assumption only pays tribute to the work done to consolidate the remains and present them in their current condition. 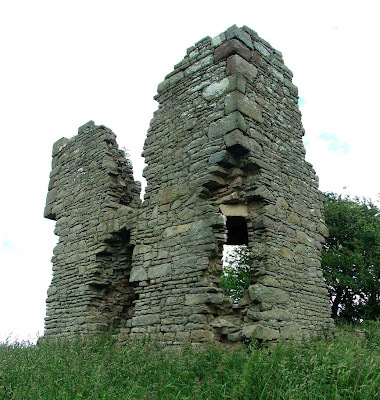 The original portion of this small castle, was probably built in the 1420’s as a simple oblong shaped tower. Above. The rear of the tower, with gun loops visible in the lower wall. Later additions turned it into an L shaped tower house, with light defences, ie; no ground floor windows, a number of small gun ports, walls of 3 or 3 and a half feet thickness and a single doorway. The stair tower, that projects out of the front of the tower, was added in 1568. 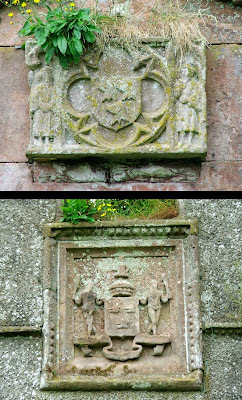 This date is indicated on a date carved above the doorway, along with the coat of arms of the builders…the Brouns. At the same time that the stair tower was added, battlements were probably removed from the north and south walls, and the addition of a wooden gallery that projected above the front of the tower. Above. A view from the first floor of the tower. The stone corbels that would have supported the roof can still be seen, along with the narrow doorway at second floor height that would have provided access to this area. Above. Another view from the first floor looking up at a second floor fire place. The first floor, second floor and third floor (top floor) would have provided accommodation for both the family and servants and visitors. Above. A view from the wall walk at the top of the tower. 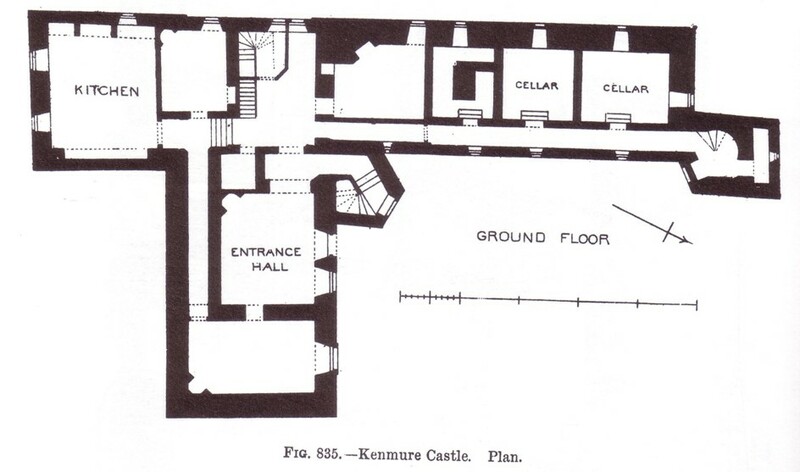 The ground floor is occupied by storage cellars with vaulted ceilings and a number of gun ports. There are tiny windows above the gun ports…probably added at a later ‘safer’ date to provide additional lighting to these otherwise dark rooms. Above. Looking into the vaulted basement with a single gun loop. The gable walls still stand to their full height, with the chimney stacks complete. The only missing structural item, as with nearly all these tower houses, are the timbers forming both floors and roofs. 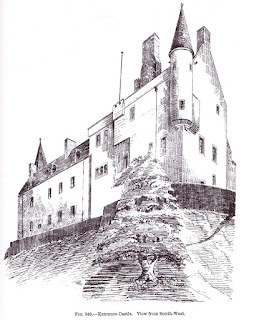 :Alexander de Cairns in 1422, presented the castle to John Cairns his nephew. :The castle was part of a dowry in 1506, and passed to Elizabeth Lindsay when John married Margaret Cairns. 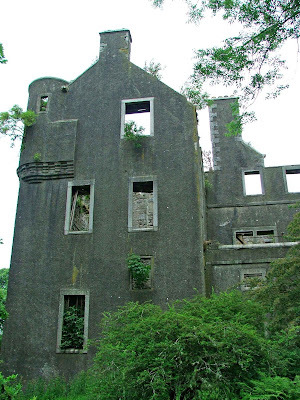 :The castle passed into the Broun family, when Elizabeth Lindsay married Richard Broun. 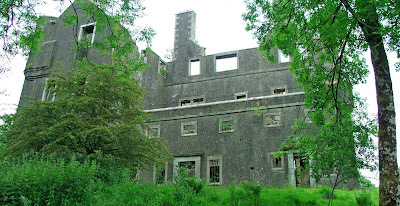 :In 1748 the estates, including the castle are sold by James Broun to Alexander Johnston. :In 1913, the castle finally found itself in state care. If you decide to visit the castle, you must pay a visit to the Marrbury Smokehouse and cafe. 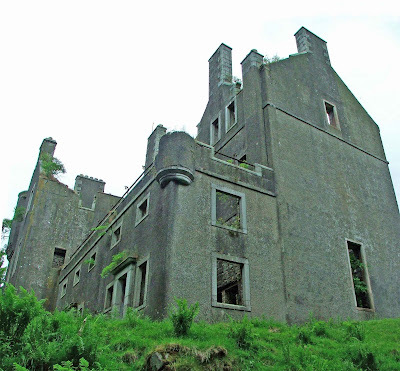 Kenmure castle is hidden away on the Western shores of Loch Ken, right at the Northern tip of the long loch, and about a mile and a half South of New Galloway. 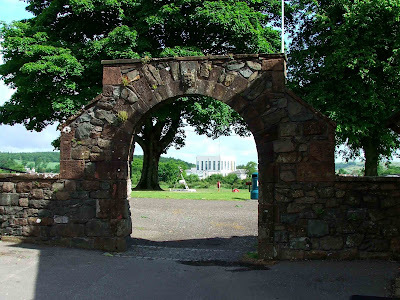 From the A713, as it follows the Eastern shores of the loch, the castle can be glimpsed above the tree line just before you reach the road that takes you across the top of the loch and West towards New Galloway. The South bound A762 then leads you back down the Western shores of the loch. The castle is hidden on your right, about a mile and a half outside New Galloway. The reason, I assume, that there are no signs or information boards for this castle, is that the site isn't owned by Historic Scotland….which is a shame really, as this castle is a pretty huge building, and is set amongst what would once have been fantastic gardens. Above. View of the castle looking South East into the old courtyard. The castle is freely accessible, and can be safely viewed from the outside. From the outside only though, as it’s in a pretty poor state of repair. 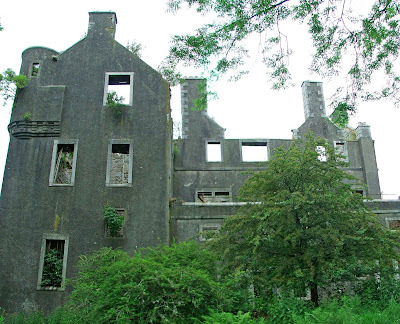 It is without its roof, and many internal floors and walls have either collapsed, or look as if they are about to. The path to the castle is on the left hand side of the road as you drive out of New Galloway, and climbing the stile takes you up what would once presumably have been the main driveway to the castle, with an avenue of trees still surviving. An open grassy area to the right looks as if it may once have been a lawned area, with the ruins of a building protruding from a earth bank to the right, possibly the remains of an ice house. The castle can be seen through the trees that line the bottom of the 100 foot hill that it sits on. The main driveway winds up the outside of, what to all intents and purposes, is a huge motte. Once at the top, the full extent of the building can be seen. In essence the castle is an L shaped building, incorporating masonry from a 16th century tower house. Most of the masonry is from a 17th century rebuild (at the earliest) with a large amount of additions dating from the 1800’s and 1900’s. 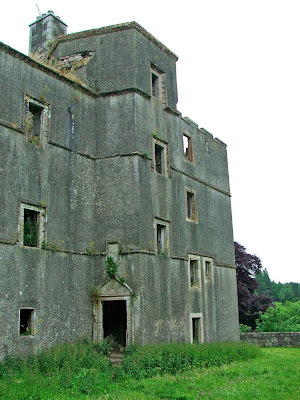 The poor state of the castle can be seen by simply glancing in through the windows. The interior floors are piled high with roof rubble, timbers, plaster, brick work and general rubbish. The building has been abandoned since the late 1950’s or 60’s, and the lack of maintenance since then is obvious. 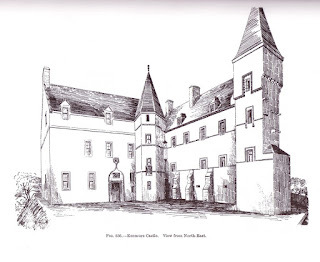 It is believed that the 19th century re-modelling of the castle, essentially removed or masked much of the 16th century building. Above. View of the West end of the castle. 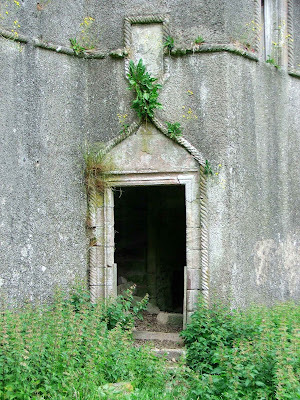 The ornate doorway, with the Gordon coats of arms over the top, probably dates from the 1630's, at a time when the 6th Laird, John, was created Viscount Kenmure. Above. View of the doorway in the courtyard. The courtyard is possibly the most interesting area to examine. 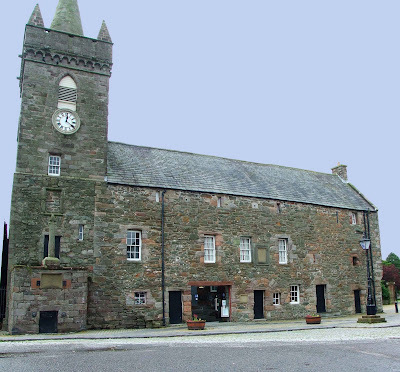 From here, you can see spiral staircases through the windows, vaulted ground floor rooms, and two Gordon coats of arms mounted above external doors, and still recognisable to this day, despite some weather wear. 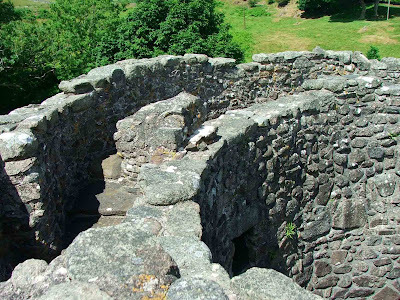 The castle occupies the top of the flat rocky outcrop, and overlooks the loch to the East. Legend has it that the ancient Lords of Galloway had a fortress here, but no traces of any earlier structures have been found. Legend also has it that John Balliol was born here in 1249. The castle belonged to the Gordons from the late 1290’s, and was amongst huge swathes of land in the area that were under their control. The castle was twice attacked and seriously damaged. Above. View of the castle looking North. The first time in 1568, after the defeat of Mary Queen of Scots. The Gordons supported Mary’s causes, and suffered at the hands of her enemies when she was defeated. Above. View of the 16th century (?) tower looking North. 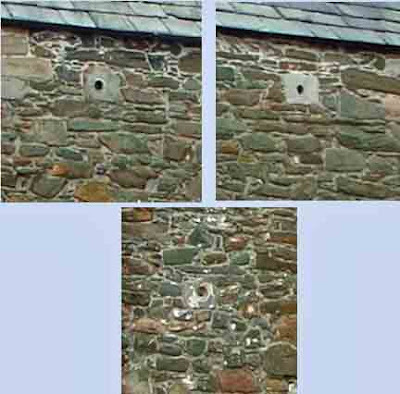 The above photo probably shows an original tower (the left hand part of the building), dating from somewhere between 1570 and 1600, with three outer walls surviving. The missing, internal wall, was knocked through when the building was extended. The walls in this tower are just under one and a half feet thick, and it's thought that the small bartizan is original from this period. At the South West corner of the building, another late 16th century structure still exists, a corner stair tower, with decorative string courses surrounding the door and windows. Above. View of the stair entrance in the courtyard. To the rear of this stair tower, there are three original (late 16th century) rooms, each with their original vaulted ceilings. A fourth room has a 19th century external wall, with original late 16th century internal walls and the vaulted ceiling. The second time Kenmure was attacked, was by Oliver Cromwell’s troops in 1650. The Gordon’s backed Charles I and again suffered when he was finally defeated. The castle was beseiged, captured and wrecked by Parliamentarian troops.The castle was renovated and turned into a palatial mansion, possibly in the early 1890’s and was again renovated and somewhat rebuilt as a hotel. Follow the links below for images on other web sites. Above. Floor plan of the ground floor of Kenmure Castle. Above. The Gardener's cottage in the grounds of Kenmure Castle, as it appears today. The above photo (copyright Pamela Graham 2009) shows the gardener's cottage as it appears today. Pamela kindly sent me these words "when my husband lived there the roof was slate tiles with the two top front windows being gabled with their own small slated roofs. 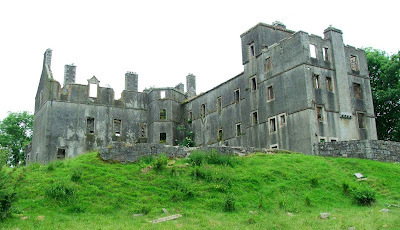 At the back there were three windows at the top floor level and two at the bottom (both barred windows). Front two windows (one now bricked up) the one door (at the front - no backdoor) which upon entering there was a landing before stair case going up to top floor where there were two bedrooms with fireplace in both. Bottom floor consisted of on left upon entering (three steps up) a lounge with fireplace & on right of front entrance also three steps up the kitchen with large open fireplace. Also in the kitchen a door to pantry/storeroom which was under the stairwell cavity. In my husband's time there there was no electricity - paraffin lamps for light!, no running water - a water pump outside on right of building for water from nearby stream - which nearly flooded the house a few times!, only two of the fireplaces were usable due to jackdaws having plugged up the fireplaces with nests over many years!! He says even though it did not have many of the comforts we have today the cottage was warm enough due to it being amongst high trees and in a hollow so the wind blew over the top. No one ever lived in the cottage after my husband's family left to live elsewhere in New Galloway (abt.1952). I daresay it is a 'renovators delight' waiting to happen but it would have to be a 'millionaire'!!. My husband had slept in the castle itself to keep the old lady who lived there alone company (he thinks a Mrs./Ms Smith)- very elaborate inside with wood panelling but said it was extremely cold. Was used as a hotel in the 50's but fell into ruin when no one wanted to maintain it anymore - I guess due to this would have been very expensive." My thanks to Pamela for kindly sending me the photo and taking the time provide these memories. This painting is by James Faed, and is housed at Broughton House gallery in Kirkcudbright. The castle lays just off the B6430 South East of Garstang in Lancashire. Although on private property, the castle can be viewed from the footpath that runs along the unclassified road that runs past the remains. There are a couple of gateways that afford good views of the scant remains. Like Kirkoswald in Cumbria, this site consists of a single tower, with some scattered masonry poking through the thick undergrowth. Above. View of the castle looking West. Primarily, today all that can be seen, is the North West facing wall of a corner tower some seven and a half metres square. 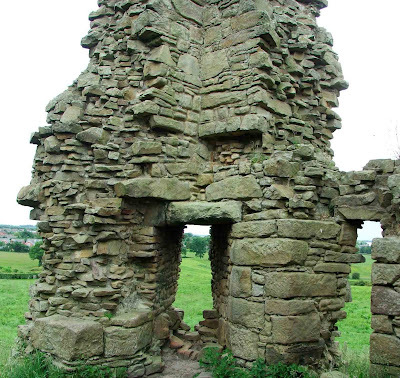 It’s likely that this tower was set diagonally to the walls it was attached to…just as at Dacre. Each corner of this tower, and perhaps the others, had small windows set in the angle of the wall, and this seems to have contributed in no small way to the collapse of the towers. The surviving portions stands to a maximum height of around 20 feet with masonry remains scattered all around the base. The castle is said to have had a wet moat, although there doesn’t seem to be any evidence of this feature now. All that can be seen, is the mound upon which the remains now sit. Above. Close up view of the surviving corner tower. Above. 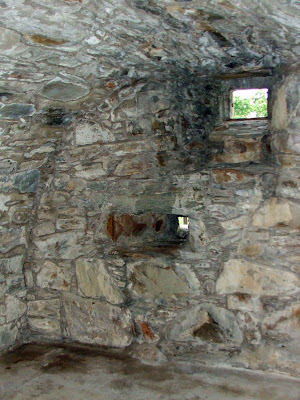 Internal view of the corner tower. The castle’s owners, the Stanleys, were granted a license to crenellate in 1490, most likely meaning that they were granted permission to rebuild and remodel the manor house that already stood on this site, rather than building a castle from scratch. The castle was demolished in 1645, when Parliamentarian forces finally took it after a long siege. 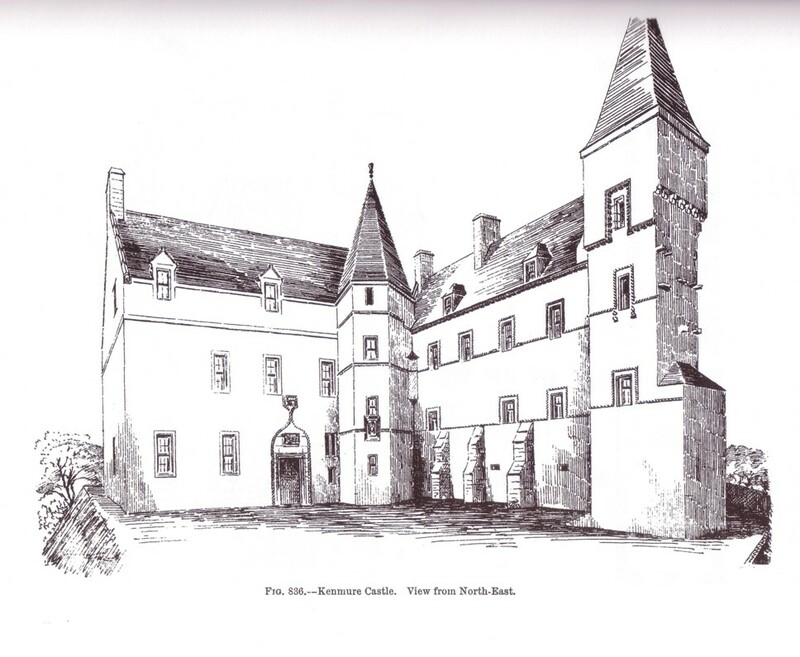 It is said that the siege lasted 2 years, and the castle was only surrendered upon condition that the garrison were given safe conduct to leave for home. Above. View of the castle looking North West. 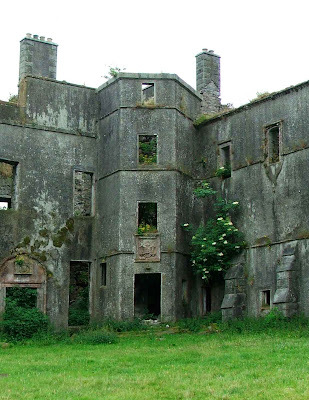 The castle continues to deteriorate, and with the combination of burrowing rabbits, the weather and encroaching vegetation, will probably continue to do so for years to come. Check the Greenhalgh web site out.